Accidents involving large trucks are among the most serious and most deadly in the United States. At Cox & Associates, Attorneys at Law P. A., we recognize that handling these cases requires a thorough understanding of commercial vehicle regulations on both the federal and state level. Trucking companies are required to follow Federal Motor Carrier Safety Regulations concerning their equipment and their drivers' hours of service. 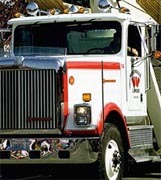 Driver fatigue is a common problem, as hours of service regulations are routinely violated. Careful examination of records after an accident often shows serious and even fraudulent violations of those safety regulations. However, trucking companies are only required to maintain many of those records for six months. Without obtaining those records before they are destroyed, the injured person or survivors of a person killed in a truck wreck has a much more difficult time proving the trucking company's negligence.